Caroline Wozniacki beat her close friend Agnieszka Radwanska, 5-7 6-2 6-4 in a fascinating battle that lasted 2 hours and 39 minutes. Radwanska was by far the better player in the first set and seemed to have a clear game plan to attack the fragile Wozniacki forehand. She got the early break but lost it and found herself down three set points at 4-5. Radwanska managed to save all three of them, two of them with weak serves to the Wozniacki forehand, which were dumped into the net. Radwanska then went onto hold and broke to love in the next game with a stunningly timed return winner and a fabulous passing shot. Radwanska then held to take the first set, 7-5. Radwanska twice claimed early breaks in the second set but Wozniacki showed her battling qualities to stay in the match. Wozniacki’s game started to gather momentum and she got the break as Radwanska started to struggle with her shoulder strapping and feel some pain resulting in her calling the trainer. This definitely affected her and the game plan started to evade her. Wozniacki got the second set, 6-2. At the start of the third set, both players held with ease before Wozniacki made the first breakthrough. Radwanska battled superbly though to break straight back after going 0-40 down on the Wozniacki serve. The last couple of game featured some tense and grinding rallies, but a fragile Wozniacki just had enough to hold on and get over the finish line. It is certainly a worry that Wozniacki struggled so much to put away an injury affected Radwanska at the end. I really think her confidence has taken a hit following some shocking losses over the summer. In the other match in the red group, Petra Kvitova completed a straight set win over Vera Zvonareva, 6-2 6-4. It was a disappointing match, which started in strange fashion with five breaks of serves. Zvonareva in fact did not hold serve once in the first set as Kvitova converted all of her break points. Kvitova was excellent in the middle of the match playing some superb tennis from the back of the court. She looked to come into the net at the earliest stage and seems to have been working hard on not just plain ball bashing, but waiting for the right moment to unleash. Kvitova did get nervous at the end of the second set as she let slip a 4-1 lead to 4-4. 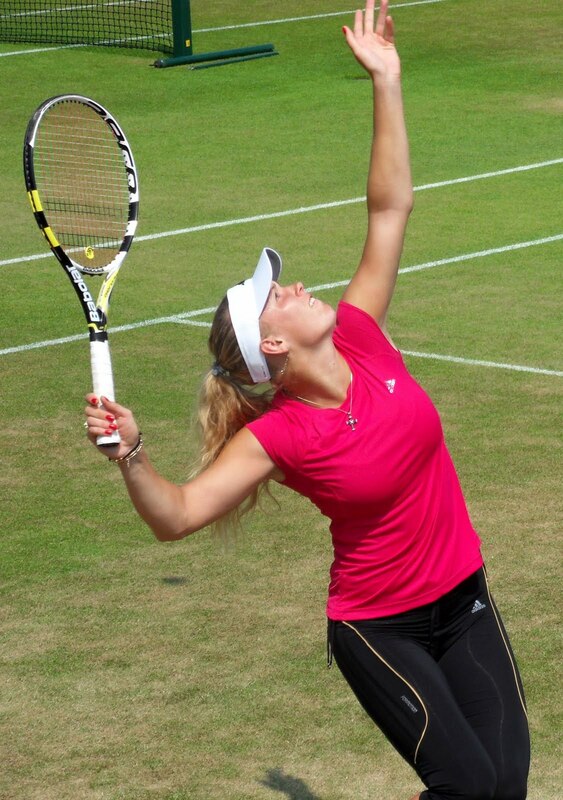 However she was helped over the finish line by a below par Zvonareva. You could see how much it meant to Kvitova as she squawked louder than I have ever seen before and also on the Zvonareva errors, which I didn’t like much! But well done Petra… she looks good to qualify from this group with Radwanska in particular looking not 100% with her shoulder. October 25, 2011 in Istanbul, Kvitova, Radwanska, Wozniacki.